Cleared PMP in my very first attempt on 02/20/2017 !!!!!! Home » Forums » PMP Exam Preparation Forum » PMP Exam Tips, Tricks and Lessons Learnt. » Cleared PMP in my very first attempt on 02/20/2017 !!!!!! It is indeed my turn now to return all the help that I received from this great forums in PMZilla. I appeared for the PMP on 02/20/2017 & successful cleared the very first attempt with P, MP, BP, MP, MP & undoubtedly, I would like to thank IZenBridge, PMZest, PMZilla for my PMP success. I didn’t go through the PMBOK even once, infact didn't even touch it. PMZest tests, 58 page notes; IZenBridge paid videos are a MUST. 5. PMZilla Lessons learned forum. That’s it. no PMBOK, no other books nothing at all. Just fill out the gaps from the questions you go wrong from practice tests. DO NOT memorize any ITTOs at all, trust me. It won’t help at all, just try to understand the logic/though process behind those processes and you will be able to crack all the situational PMP questions. PMP exam is Situational, Situational and ONLY Situational. Make sure your concepts are super clear and transparent. & you are all set. Gracias PMZilla, PMZest, IzenBridge !!!!!! Wow. 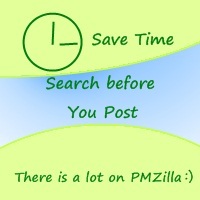 Great to hear you cleared PMP and thanks for endorsing PMZilla questions. !! !.